Statin Drugs – The Real Reason Official Guidelines Still Demonize Fats Despite the Evidence? 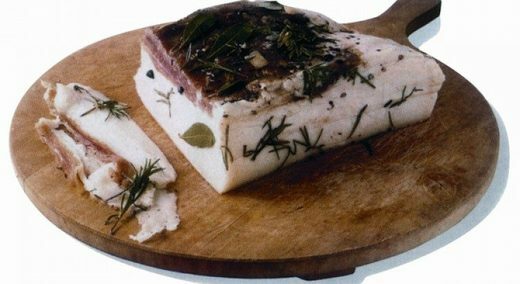 Lardo di Colonnata – A lard specialty from Tuscany, real Mediterranean food! Nina Teicholz, investigative journalist and author of the International bestseller The Big Fat Surprise, wrote an article for the BMJ (formerly the British Medical Journal) in September 2015, which makes the case for the inadequacy of the scientific advice that underpins the Dietary Guidelines (Teicholz, 2015). The title of the article was “The scientific report guiding the U.S. dietary guidelines: is it scientific?” Ian Leslie writing for The Guardian reports that the response of the nutrition establishment was ferocious: 173 scientists – some of whom were on the advisory panel, and many of whose work had been critiqued in Teicholz’s book – signed a letter to the BMJ, demanding it retract the piece (Leslie, 2016). Prominent cardiovascular and nutrition scientists from 19 countries called for the retraction. However, to this day, the article remains published. The BMJ has officially announced that it will not retract the peer-reviewed investigation after stating that two independent experts conducted formal post-publication reviews of the article and found no grounds for retraction (Sboros, 2016). Yet, behind every mainstream medical practice, strict questionable guidelines are still followed faithfully every day. Doctors are still following cholesterol targets that are often unattainable without cholesterol lowering drugs, but many do try to achieve their targets with extremely low fat diets recommended irresponsibly in dietary guidelines. Unfortunately the rest of the world has followed suit on these dietary changes. Traditional high fat foods have been given up for the low fat scam. Promoters of the highly touted Mediterranean diet, with its olive oil and ‘low animal fat’, fail to mention the fact that there are still fat loaded recipes that were passed from generation to generation among the Mediterranean people. Lardo di Colonnata with its cured strips of fatback and herbs and spices; Greek barbecue which often involves an entire lamb roasted on a spit; or the kokoretsi which is made from the internal organs of the lamb – liver, spleen, heart, glands – threaded onto skewers along with the fatty membrane from the lamb intestines, all of these are foods of the long-lived Mediterranean people. Yet the ‘American style Mediterranean Diet’ selectively picks foods from the diet of the Mediterranean people to give the picture they desire. Ironically, many of the Mediterranean people have adopted this Americanized version of the ‘Mediterranean Diet’. The truth is that cholesterol is a substance our bodies make naturally, and it’s absolutely essential to our health. Cholesterol is so crucial that the body produces some 1000-1400 milligrams of it each day, mainly in the liver. Cholesterol is also synthesized to a smaller extent in the adrenal glands, intestines, reproductive organs, etc. We are told by the “Official Thought-Control Institutions” to limit consumption to less than 300 milligrams of cholesterol per day, but our liver’s production of cholesterol is controlled by a feedback mechanism based on how much we eat. If we eat a lot of cholesterol, we produce less, leaving much needed liver energy for other important tasks. If we eat little cholesterol, replacing it with carbohydrates and vegetable oils, then the body will produce the cholesterol from these dietary raw materials. However, a high-carb and vegetable oil diet yields a very bad cholesterol profile even when the cholesterol is in normal range. If we hardly eat any cholesterol and we block its production with lowering cholesterol drugs, then we are limiting the supply of something the body desperately needs for its proper function. Yet statins, cholesterol-lowering drugs, are among the most profitable drugs in the history of the world. Restricting or eliminating cholesterol in the diet overburdens the liver, which now has to overproduce it through its enzyme HMG-CoA reductase from food in our diet. This enzyme is the one that is blocked by statin drugs for the purpose of lowering the amount of cholesterol the body produces. But, as with all pharmaceuticals, it comes with a price. HMG-CoA reductase is also the enzyme needed for the creation of coenzyme Q10 (CoQ10), which is a key nutrient for energy production in our cells. CoQ10 is also a major antioxidant. People complain of muscle cramps or aches while on statins drugs. Keep in mind that your heart is a muscle as well. Coincidence or not, the incidence of congestive heart failure has spiked during the time statins have been a top selling drug. Even when statin drugs are not at fault for the increased prevalence of congestive heart failure during the last decades, we don’t necessarily want to decrease CoQ10 levels in a failing heart. Coenzyme Q10 – also called ubiquinone, which means ‘occurring everywhere’ – plays an important role in the manufacture of ATP, the fuel of our cells. It is present in every cell of our bodies, especially in the very active cells of our hearts. Depriving the heart of CoQ10 is like removing the spark plug from an engine. It just won’t work. Low levels of CoQ10 are involved in practically all cardiovascular diseases including angina, hypertension, cardiomyopathy and congestive heart failure (Sarter, 2002). It is ironic that statins, for “heart health”, block coenzyme Q10. Statins’ many potential side effects include depression, confusion, memory problems and inability to concentrate. It hinders our body’s ability to fight microbes, increases liver damage, increases risk of cancer, fatigue, impotence, kidney failure, rhabdomyolysis (destruction of muscle cells) and shortness of breath among other things (for a database on statin adverse effects, see here). Cholesterol levels that are below 150 mg/dL may increase the risk for cancer, hormonal imbalances, depression, sexual dysfunction, memory loss, Parkinson’s disease, type 2 diabetes, stroke, suicide, and violent behavior. We make highly unstable and dysfunctional cell membranes when we restrict organic animal fats. This harmful effect has far reaching consequences. And doctors, unfortunately, don’t seem to be receiving this information. The past decade of research has shown the importance of cholesterol-rich membranes and their fundamental implications for our brain and nervous tissue, immune system and all areas where lipoproteins are created, secreted, delivered and utilized. Cholesterol is so vital to the formation and correct operation of the brain that neurons require additional cholesterol to be secreted by brain cells. No wonder some people lose their memories with statin therapy! Statin drugs also impair the secretion of new myelin, the fatty coating that covers the nerve cells and facilitates their firing. The connection between cholesterol and its fundamental role in the immune system and in the cell membrane should also be kept in mind when it comes to autoimmune diseases. Modern guidelines say that it is desirable to have a level of total cholesterol of less than 200 mg/dL. When I was in medical school, which was not that long ago, the upper limit was 240 mg/dL. Once upon a time, it used to be 280 mg/dl. Apparently, in 1970, the rule-of-thumb for a healthy serum cholesterol was in the 200 plus range. Now most doctors try to keep cholesterol below 200, which most people find very difficult (if not impossible) to achieve through diet and lifestyle changes alone. Since then, statin drugs like Lipitor became one of the all-time top-selling drugs in history (Angell, 2005). That is, the declaration of interest only covers 2014 and 2015, and it is not given by a third party. Most of the authors have so many links to Big Pharma that their declaration of interest can take an entire page. The reader can have fun searching for Big Pharma sponsoring for the years not covered for both the sponsored and the few authors who had nothing to declare in 2014 and 2015. I challenge anyone to find at least one author who chose to attend only conferences that were not financed by Big Pharma as a general rule for his entire career. “If drug companies and medical educators were really providing education, doctors and academic institutions would pay them for their services. When you take piano lessons, you pay the teacher, not the other way around. But in this case, industry pays the academic institutions and faculty, and even the doctors who take the courses. The companies are simply buying access to medical school faculty and to doctors in training and practice. It’s easy to fault drug companies for much of what I’ve described, and they certainly deserve a great deal of blame. Most of the big drug companies have paid huge fines to settle charges of illegal activities. Last year Pfizer pleaded guilty and agreed to pay $2.3 billion to settle criminal and civil charges of marketing drugs for off-label uses-the largest criminal fine in history. The fines, while enormous, are still dwarfed by the profits generated by these activities, and are therefore not much of a deterrent. Still, apologists might argue that, despite its legal transgressions, the pharmaceutical industry is merely trying to do its primary job-furthering the interests of its investors-and sometimes it simply goes a little too far. If only health care professionals at large would take a stand against the massive conflict of interests from pharmaceutical and food industries and their role in the corruption of the medical science, it wouldn’t have come to the point where there are guidelines advising the reduction of cholesterol to levels never seen before in medical records. Another line of research would have been followed where dietary and environmental factors and their role in inflammation and our health would play a greater role. Hopefully we will wake up soon, otherwise we risk a guideline recommending zero levels of LDL cholesterol. It sounds absurd, but then, I thought that an LDL target 35 mg/dL would shock conventional practitioners to realize the absurdity of these recommendations, and that doesn’t seem to have happened. Statin drugs are among the most profitable drugs in the history of the world. Those profits buy a lot of propaganda: lobbyists, advertising and marketing to doctors, and free continuing medical education. Think of what even a small percentage of their massive profits could do for prevention if it were invested in public education towards a truly health promoting diet. Think of all the diseases that would essentially disappear from the face of the planet. But expecting a corporation to willingly cut off its main source of profit is a pipe dream. Even if they knew the truth about diet, it would be kept as the most tightly guarded secret in history. It’s really not in the drug-maker’s’ best interest to have people making healthy dietary choices. So instead of promoting prevention strategies, cholesterol drugs continue to post record-breaking profits and create poor health and side effects in the people taking them. Those people in poor health can then be treated with more drugs. How many people do you know on multiple medications for various ailments? Whether the cause if malfeasance or ignorance is largely irrelevant because the result is the same. It is only your own awareness that can turn things around. The public is gradually awakening to the fact that statins are virtually useless for the vast majority of people who take them, and yet they carry significant risks. So again we see guidelines being written to favor the industry and the over-medicalization of millions of people. Ironically, the very same experts for some of these guidelines disagree, calling for expert groups such as the Adult Treatment Panel (ATP) IV to “abandon the paradigm of treating patients to LDL targets” (Hayward & Krumholz, 2012). Blinded by the numbers, doctors will see LDL levels at 70 and say their patients are doing well. They could fail to see what might actually be in front of their eyes – an ill-looking and nutritionally deficient person. Cracking skin, plunging libido, muscle wasting, memory problems, blood sugar imbalances, premature aging – but hey, cholesterol numbers are right on the money! It is astounding to see how we as doctors do so little critical thinking, focusing only on arbitrary guidelines dictated by the same companies selling the drugs that are the only things that make the numbers possible. Talk about a collective blind spot facilitated by decades of programmed schooling. Even when a patient points out, ‘but I eat no fats and no salt and I’m getting worse!’, we might fail to connect the dots. As if this weren’t enough, here’s another bit of irony. In one study, the use of statin drugs was associated with microalbuminuria (Van Der Tol et al., 2012). Microalbuminuria is a marker of poor endothelial function and it’s endothelial function which determines cardiovascular disease risk. Microalbuminuria is also a marker of kidney problems. Similarly, in a study of nearly 26,000 beneficiaries of Tricare – the military health system in the United States – those taking statin drugs to control their cholesterol were 87 percent more likely to develop diabetes. The research confirmed past findings on the link between statins and diabetes risk, but it is among the first to show the connection in a relatively healthy group of people. The study included only people who at baseline were free of heart disease, diabetes, and other severe chronic disease (Veterans Affairs Research Communications, 2015). In this same study, statin use was also associated with a very high risk of diabetes complications. Among 3351 pairs of similar patients–part of the overall study group–those patients on statins were 250 percent more likely than their non-statin-using counterparts to develop diabetes with complications (Mansi, Frei, Wang, & Mortensen, 2015). Statin users were also 14 percent more likely to become overweight or obese after being on the drugs. The study also found that the higher the dose of any of the statins, the greater the risk of diabetes, diabetes complications, and obesity. Ironically, it is those who have had a cardiovascular disease event who are prescribed higher doses of statin drugs. Moreover, more frequent statin drug use is associated with accelerated coronary artery and aortic artery calcification, both of which greatly contribute to cardiovascular and all-cause mortality (Saremi, Bahn, & Reaven, 2012). An evaluation of thousands of individuals with no known cardiovascular disease and undergoing a coronary CT angiography which visualizes atherosclerosis, concluded that statin use is associated with an increased prevalence and extent of coronary plaques possessing calcium (Nakazato et al., 2012). So doctors might be prescribing a medicine that contributes to onset of the very thing they are trying to prevent. In the meantime, people are getting increasingly high levels of calcified hearts. During heart surgery, the surgical instrument known as the ‘bone eater’ ends up being used to replace valves that should have remained silky and smooth. I know what I speak after witnessing and conducting thousands of open heart surgeries in three different countries. The picture isn’t pretty. The decades of massive anti-fat propaganda has brainwashed all of us without exception. Upon being questioned about their dietary habits, a patient might guiltily recall all the fats they ate and think that those are to blame for their health woes. Never mind that they eat mostly carbs, or that most of the fats they do eat are of the processed, plastic and vegetable oil variety. On doctors orders, they remove the animal fat from their diets, thereby increasing the carbs and vegetable oils, the very two steps that will deteriorate their health. When and if cholesterol targets are not reached by these measures, then the doctor has ‘no choice’ but to put them on a statin drug. There is, however, a small percentage of people out there who genuinely have a true genetic predisposition to high blood cholesterol called familial hypercholesterolemia, which is a condition which is characterized by an impaired or even lack of ability to metabolize cholesterol. This condition can have serious health consequences and sufferers may need medical interventions to bring their cholesterol levels down. But that doesn’t mean this can be extrapolated to all people who don’t have this genetic problem. Medical research has not proven that lowering (or low) cholesterol in and of itself reduces risk of death from heart disease across a population (Siri-Tarino, Sun, Hu, & Krauss, 2010; Chowdhury et al., 2014). Men with very low cholesterol levels seem prone to premature death. Below 160 milligrams per deciliter (mg/dl), the lower the cholesterol level, the shorter the lifespan. These men die of cancer, respiratory and digestive diseases, and trauma (Smith, 1997). As for women, if anything, the higher their cholesterol, the longer they seem to live (Teicholz, 2014). Despite these facts, it is estimated that by 2020, revenues from statin drug sales will reach 1 trillion dollars. Never mind that most people taking these drugs are not at risk for heart disease. Angell, M. (2005). The truth about the drug companies: How they deceive us and what to do about it. New York: Random House Trade Paperbacks. Teicholz, N. (2014). The big fat surprise: Why butter, meat, and cheese belong in a healthy diet. New York: Simon and Schuster. Wainwright, G., Mascitelli, L., & Goldstein, M. R. (2009). Cholesterol lowering therapies and membrane cholesterol. Stable plaque at the expense of unstable membranes? Archives of Medical Science, (5), 289-295. Pentoxifylline – Big Pharma’s wonder drug?